Watco is proud to have been chosen as the HVAC Contractor for this project!! DURHAM, N.C. – Construction has begun on the new Duke Multi-Purpose Fieldhouse, located at the Brooks Practice Facility just south of Wallace Wade Stadium. 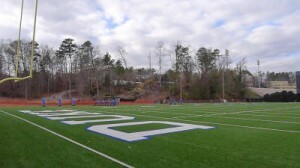 The 80,000-square foot facility features a 120-yard playing surface and is expected to be completed in August of 2011. The building, designed and constructed by The Beck Group with primary use scheduled for Duke’s football and campus recreation programs, will have a 65-foot ceiling at its peak and also include a filming tower, retractable goalpost and locker room facility for game officials. The lead gift of $6 million was provided by former Duke All-America running back Bob Pascal. Pascal lettered three seasons (1953-54-55) on the gridiron at Duke, helping the Blue Devils to a 22-6-3 record including the 1954 ACC championship and 34-7 win over Nebraska in the Orange Bowl. A two-time All-ACC pick, the Bloomfield, N.J., native was a first team All-America selection in 1955 after rushing for 750 yards and eight touchdowns. He finished his career with 1,523 rushing yards and 23 touchdowns, and was third round choice of the Baltimore Colts in the 1956 NFL Draft. March 7, 2011 | Filed under Uncategorized.